As we move briskly into the 21st Century it is perhaps inevitable, and also lamentable, that some past history is forgotten. Film suffers as much as any other art form in this regard, for each new cinematic release adds another few lines to review books and occupies another space on the DVD rack in high street shops. Thus it is that filmmakers and films themselves, once household names who became slightly marginalised, find themselves now omitted from books, the films barely available unless one knows where to look online. It is the task of present generations not only to find their own niche but also to keep alive the spirit of those who laid the foundations for what followed. After all, without any idea of context and who originally did what, youngsters of today might believe the songwriting ability of Westlife to be second to none: Seasons In The Sun, Uptown Girl and Miss You Nights to name but three. As the author of Silent Comedy, Paul Merton is a prime example of a modern popular entertainer who openly acknowledges his debt to the great heritage of silent comedy. His book, coming hard on the heels of his excellent BBC television series Paul Merton’s Silent Clowns, does exactly that. This book, though, is not merely a re-working of that series although it does, by necessity, cover the four leading comedians profiled for the BBC (Buster Keaton, Charlie Chaplin, Laurel & Hardy and Harold Lloyd). Instead, the book paints a vivid picture of the development of film comedy in the pioneering days before sound by interweaving the careers of all the comedians concerned. It is also refreshing that Paul Merton does not stop at the comedians that are still familiar to 21st Century Britain but also highlights those who were influential but have since been overlooked, such as Larry Semon and Harry Langdon. A key strength of Silent Comedy is its straightforward approach- a clear set of ten main chapters dealing with key moments separated by stylish pages deliberately resembling film intertitles placed opposite an appropriate full colour poster or lobby card. This simple- but highly effective- organisation enables the book to be instantly appealing and accessible, a marked change from some books about silent cinema which are aimed squarely at the academic who already possesses some detailed knowledge. Paul Merton makes no such assumptions about his reader, and the result is a delightful melange of thoughtful narrative insight, personal enthusiasms (such as the double-page spread on the 1929 Laurel and Hardy film Big Business) and high quality images. The double-page spreads themselves are worthy of special mention, for their full and varied colour contrasts the white background of the majority of the book yet compliments the rest of Silent Comedy most delightfully as they provide a focus on a specific moment of silent film history (whether it be one particular comedian, a key film or simply the context of silent film production). The rest of the book takes a largely chronological approach towards charting the development of silent comedy but does tell the story through its key players. Such a story is an ambitious task, but Paul Merton approaches it and accomplishes it with an equal degree of relish. Unlike many more picture-dominated books about silent cinema, Merton’s use of rare behind-the-scenes (or ‘candid’) stills to supplement frames from the films is a huge plus, for it makes his book that bit different from other accounts of silent screen comedy. Although the book is titled ‘Silent Cinema’, Chapter Ten provides a fitting epilogue with its focus on the coming of film sound. Merton is able to use this as a springboard to unravel the main comedians (Keaton, Chaplin, Laurel & Hardy and Lloyd) and provide a brief resume of their final years. The book is completed by a thorough reference section which makes it very easy to use and provides a satisfying conclusion. All in all, Silent Comedy is a superb piece of work- Merton is able to use his insight into how comedy works to explain why these comedians were so great and still deserve to be remembered (and even celebrated) today. One of the main problems with a book such as this could be either the absence of the author’s personality or, alternatively, too much of it. Paul Merton manages to tread this fine line to perfection, using anecdotes to personalise and bring alive the whole experience of enjoying silent films without it becoming a book about his cinema-going preferences. In Silent Comedy Paul Merton acts as ambassador- not only for those comedians he spotlights and the famous films he enthuses about, but also for those who have been forgotten by time. Silent Comedy should hopefully serve to attract many new fans to the joys of silent cinema, but there is plenty within its smart covers to appeal to those who are already converts of pre-talkie comedy. 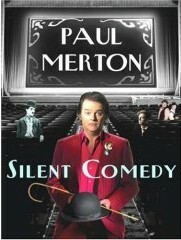 'Silent Comedy' is published by Random House.